What exactly are the Japanese used car auctions? Are they a place where anyone in the Japanese public can go and buy a car? How many vehicles go through the Japanese auctions? What are the main auction groups? What is the best time of the year / cheapest time of year to buy? The Japanese used car auctions are a place where dealers, not the public, sell used and new vehicles (though technically these are “used cars”) to each other. Many exporters have done the 2 step process to become members of these auctions. One, they have become a used car dealer. Next they have built up memberships in each of the auctions. That process in itself is lengthy and often involves guarantors, an antiquated system that still remains in Japan. Only then do they attain bidding rights to purchase from the auctions. Many exporters choose rather to buy through a secondary party, such as ASNET. This is not the best way to purchase however, as their is no control over the bidding process and often the car will be purchased at a more expensive price. As mentioned, only dealers registered in Japan have the rights to attend and bid on vehicles. However, it is very common for a dealer to take the public, including foreign buyers, into the auctions, although officially it is against their policies. Often you will be required to wear an ID identifying you as one of the “employees” of dealers company. The auctions know foreign buyers are a major (30 to 40% of sales) influence to the selling price of vehicles in the auctions. The HAA or Hanaten group. This group only holds 2 auctions, but the Saturday HAA auction is the second biggest in Japan, so deserves to be on this list. 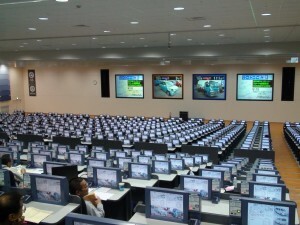 Supply of vehicles to the Japanese car auctions comes from various sources. The main source for the “Maker” auctions such as Toyota, Honda and Nissan are traded-in vehicles. When a customer purchases a new vehicle the “Maker” usually gives the customer what looks like a good bargain for his used vehicle (when actual fact this cost is already built into the price of the new vehicle). The Maker dealers are not restricted to their own auctions and regularly sell their cars into the mainstream auctions as well. The second supply of vehicles comes from the normal used car dealer network. The largest of these being companies like “Gullivar” who sell their trade ins through the auctions. The most common style of bidding is done live by clicking a button, though the process is a lot more complicated than it seems. This form of bidding is similar to a “war of attrition”, you keep on clicking on the button until the other party can not afford another cent (yen), and the car is bought at the top price to the seller. The largest of these is the USS Tokyo auction, where 8 lanes of cars are sold at the same time non stop until the auction finishes. No brakes for lunch or dinner. Other means of bidding occur in the “Nyusatsu Auctions“. This is a tender type of bidding. A registered bid is secretly placed with the auction. At a set time the auction declares the winner. Bargains are often made in the “Nyusatsu” auctions though cars can be lost to another party by just a few yen. The “oral” auction system led by an auctioneer at the front no longer exists. The peak period is influenced by the Japanese “car tax” and accounting system. The Japanese accounting year finishes on March 31st. Companies and dealers, for tax purposes, want to reduce their inventory of vehicles by this date. They put their vehicles into the auctions at must sell prices to reduce their stock for tax purposes. Car tax (the larger the engine the larger the tax) is also to be paid by the owner every April. Companies and individuals therefore will often hold onto their vehicle until the car tax is to be paid and then trade it into to a dealer, who in turns sells into the auctions. Due to demand and supply, when supply is high, March, April the prices are low. This is the best time to buy and generally Provide Cars customers purchase the most this time of year. Sometimes there is so much stock in the auction in this season that some auctions go on until the early hours of the morning!